A supporter of ReincarnationResearch.com suggested that April Ryan, a CNN political analyst, who was named as the Journalist of the Year by the National Association of Black Journalists, may be the reincarnation of Ida Bell-Wells Barnett. Ida Wells-Barnett was an African-American journalist and early leader of Civil Rights Movement in the United States. Ida, who was born as a slave in 1862, was freed by Abraham Lincoln’s Emancipation Proclamation during the American Civil War. Ida helped start the Memphis Free Speech and Headlight newspaper and she exposed the horror of the lynching of Black Americans. She was also active in the Women’s Suffragette movement, which lead to the right for American women to vote. Physical Resemblance in Reincarnation Cases: The facial features of Ida Wells and April Ryan are similar. Click on images to enlarge them. 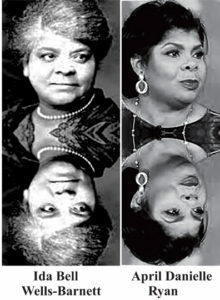 Past Life Talent and Passion: Ida Wells and April Ryan have both been journalists of great merit and advocates for Civil Rights in the United States.